These hand-dyed tassels make a lovely focal for this simple necklace from Oh the Lovely Things. Take a look at the DIY ombre tassel necklace tutorial from Clemence. Take a look at this pretty hair accessory from Kristiina at Typical House Cat. These golden chains look lovely with her golden locks – and on her previous DIY chain-fringe handbag project, too. Here’s a 2-minute tutorial from Honor for terrific tassel earrings. Get the tutorial at Home Heart Craft. Take a look at these pretty earrings from Seven Alive. Use filigree components for a patriotic theme or your favorite sports team! See how Kadie made them at Seven Alive. Just in time for summer camp! This video tutorial will teach you to make colorful friendship bracelets using forward spiral knots. Book Giveaways End this Week! Don’t miss your chance to enter for a copy of Simply Stylish Crystal Jewelry! The giveaway ends tomorrow July 3 – hurry to the original post and comment for your chance to win! Here’s a fun crafty project that is perfect for creating with your kids! Jenni shows how to make this cute necklace from wooden beads. See how easy it is at Vintage Umbrella. Beaded Bugs giveaway ends Saturday! Don’t miss your chance to win a copy of this fabulous book. Leave a comment at the original post to enter now! Win 10 Instant Scrapbook Necklaces! 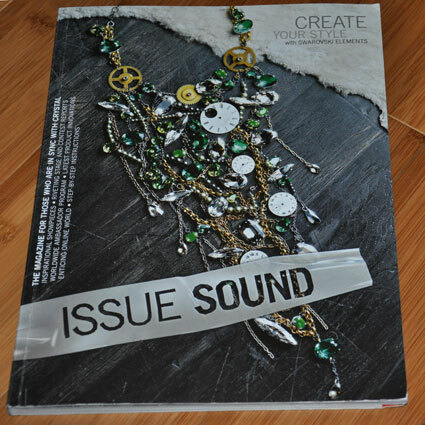 If you haven’t entered the drawing for a free copy of Create Your Style with Swarovski Elements, time is running out. Leave a comment at the original post to enter!